The writer had the privilege of having a long chat with the eminent surgeon at his residence in Turret Road (Dharmapala Mawatha) in 1997 to discuss his acceptance of an invitation to be the Chief Guest at a Star Awards ceremony of the institution that he was working at the time. The 85-year-old world renowned surgeon wanted every little detail of the ceremony meticulously explained and also some literature on the organisation. “I say, I do not know why these fellows call me Anthonis, my name is Untho..nis”, said the modest surgeon Deshamanya, Dr. P. R. Anthonis, who had performed more than 60,000 operations by then including the famous five and a half-hour surgery on Prime Minister SWRD Bandaranaike on September 25, 1959 when an assassin fired three shots at point blank range on him. Even at 85 he continued his profession. Dr. Anthonis was born on January 21, 1911 to a family of 16, as the second child who was named Romiel Anthonis. Prime Minister Dudley Senanayake’s devout follower Mohottalage Dingiri Banda was the Minister of Agriculture and Food from 1965 to 1970. Member of Parliament from 1940s and a Cabinet Minister later, M.D. Banda stands out as an example of a politician of unquestionable honour and integrity. He was born in a small village of Panaliya situated in the Sath Korale. Dingiri Banda attended Nalanda College and later St.Anthony’s, where he passed the London Matriculation before entering University College to study law. Elderly villagers addressed him “Hamuduruvo” and tried to worship him as did with other DROs of the colonial Ceylon, during his first appointment as a District Revenue Officer at 24 years, a position just below the GA. He would vehemently object to them by saying I am not a Sangha, please do not address me Hamuduruwo or bowdown. The usual tradition of bag loads of vegetables and ‘kiri-peni’ from poor villages he also discouraged them by paying them a reasonable amount for the ‘gift’; by doing so developed a group of enemies in the public service. Disturbed by a scathing attack by a politico in the presence of his superior, the Government Agent who failed to defend him, he handed over his letter of resignation to the GA on the following morning. During this time a commission of inquiry found the sitting member for Nuwara-Eliya in State Council guilty of bribery and corruption which led to his resignation. People urged him to contest the bi-election. Mr. Banda agreed and contested and won with a significant majority. However, a subsequent polls case made him unseated. He could have retained the seat only if he listened and agreed to lie in courts, as island’s leading lawyer at the time R. L. Pereira who defended him wanted him to do. Dingiri Banda was asked to refuse to identify a group of his supporters as not known to him who acted against election law in obstructing voters opposed to them from casting their ballot. “They are my men, how can I tell a lie?”. The case was proved and Mr. Banda was unseated. D. S. Senanayake had an extraordinary talent in recognizing young honest men, he sent for M. D. Banda requesting him to join his new party UNP and contest a seat in 1947. The natural choice was the newly created Maturata seat was a newly carved out seat which Banda selected at the election held in 1947 to score a resounding victory which he retained in his entire political career winning it at 1956 as well when the party was reduced to eight in parliament. In 1960 at the next delimitation of seats two new seats came up replacing Maturata, Hanguranketa and Walapane and at the 1960 March and July elections Banda won Hanguranketa. In 1965 Mr. Banda decided to contest his birth place Polgahawela where he had donated valuable ancestral property for the expansion of schools in the electorate and won at the General Elections. 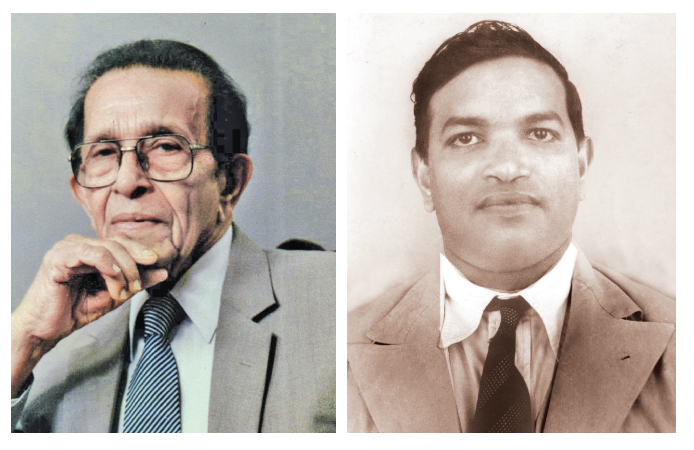 These two great sons of Sri Lanka, the famous surgeon Dr. Anthonis and M. D. Banda the politician both belonged to an era when politicians were ‘Mr cleans’ and doctors were not parasitic blood-suckers. Mr. Banda, who belonged to a rural background, is best considered as one of the closest of Prime Minister DS and son Dudley Senanayake from 1947 to 1970 in their governments. He became Minster of Agriculture in Dudley Senanayake’s Cabinet. Can one believe this interesting saga, which I am about to relate where both these public figures ‘crossed each other’ at a private nursing home in the city over a settlement of a bill. Banda, though an Antonian sent all three of his sons to Ananda College who attended school from the school’s hostel. The eldest of the three Gamini Bandara suffered an attack of Appendicitis in the latter part of 1968 while residing in hostel and the doctor summoned by warden being told it was minister’s son he directed the patient to a private nursing home for urgent attention by the island’s number one, the eminent surgeon, Deshamanya Dr. P. R. Anthonis who immediately carried out an operation to remove the infected Appendix. “Sir, you are doing a great service for my motherland, how can I take money from you?” Minister Banda did not want to obtain free services; he insisted that the doctor charged his professional fee: the ‘argument’ ended in a stalemate; they complemented each other before leaving the hospital.